With July 4th approaching many Delawareans are anxiously awaiting the first home-grown tomato from the vegetable garden. You probably have most of your summer crops planted, so now is the time to focus on weed control. Weeds steal moisture, nutrients, sunlight and growing space from crop plants. Their presence can reduce crop growth, quality and yield. They can also make harvest difficult and they provide cover for diseases, insects and animal pests. The first line of defense is to plant crops in combination, using sprawling crops like squash, pumpkins, cucumbers, potatoes, etc. 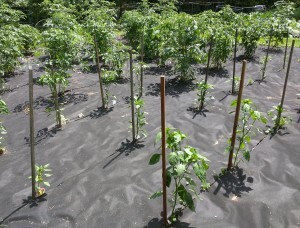 to shade the ground around taller crops like corn, pole beans, peppers and tomatoes. This is the concept between the native American planting of the three sisters—corn, beans and squash. Corn provides structure for beans to climb. Beans fix nitrogen from the air and put it back into the soil and squash covers the ground to reduce weeds. Fall planted cover crops that you till in prior to spring planting, like winter wheat, will reduce winter annual weed germination and as a bonus, improve soil by adding compost. Use mulch to suppress weeds in the vegetable garden. Many annual weeds require light to germinate, so a relatively thin covering a mulch can reduce many weed problems. For tougher weeds, use a thicker layer of mulch (3-4 inches). Organic mulches, like grass clippings, yard waste, shredded newspaper or straw provide some flexibility because they can be raked around existing plants. Do not use straw with weed seeds. Salt hay is a good alternative that will not contain seeds. If you use grass clippings, know their source and make sure the grass has not been treated recently with an herbicide. Landscape fabric that allows water penetration is an excellent inorganic mulch to use in the vegetable garden. Install the sheets of fabric at the time of planting. Landscape fabric can be used for many years if you carefully remove it in the fall and store it indoors over the winter. Be sure to by good quality, name brand landscape fabric. You can also use black plastic to cover areas of the garden you are not currently using. Don’t put black plastic around growing crops because it will exclude water. If you have a fallow section of the garden, even for a few weeks prior to the next successional crop, black plastic can kill existing weeds by excluding light and raising the soil temperature, so that section of the garden is ready for planting when you are ready to use it. Tilling is another important method of vegetable garden weed control. It is easier to kill weeds by tilling when they are young. Seedlings can be dug up and their roots exposed to air with a hoe. Once weeds get to be 3 inches tall, they cannot be easily tilled and should be hand pulled, using a trowel to get the entire root system. Once you have hand weeded an area of the garden, cover it quickly with mulch to reduce the need to continue weeding all summer long. Herbicides can be used with great care in a vegetable garden. Before a crop is present, glyphosate (commonly sold as Roundup or other generics) can be applied to kill all the present green growth. Once you have crops in the ground, avoid using glyphosate in your garden. Treflan can be used to control germinating weed seedling before the crop emerges. Poast is a grass herbicide that will kill grass plants without harming broadleaf crops. Weeds are best controlled preventatively in the garden. Once you have a lush stand of weeds, you will spend many hours removing them. But, a few hours spent applying mulch or tilling seedling weeds will prevent problems later on. Never allow weeds to go to seed in the garden. That increases your weed pressure for later in the season or the following year. 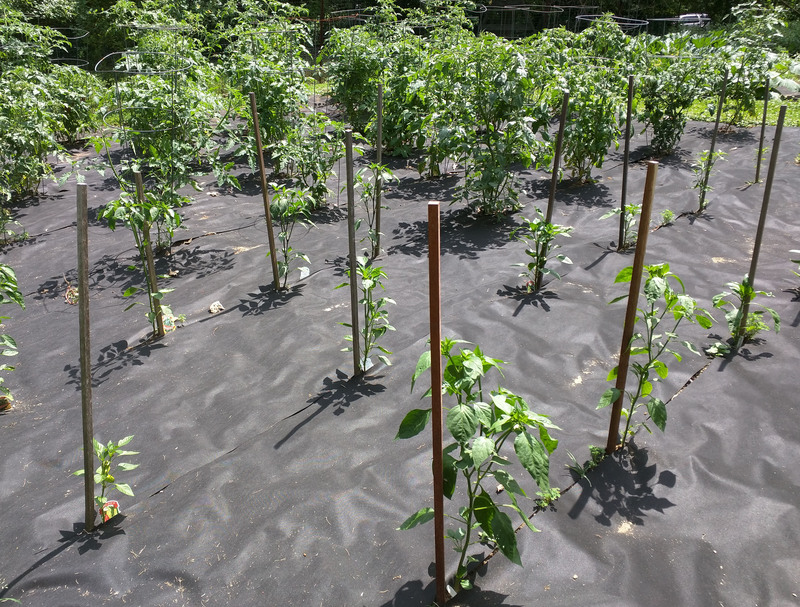 Tomatoes and peppers planted with weed control fabric are completely weed free. Enjoy those first ripe, red tomatoes!